This very early and rare example of an Eskimo dark wood mask, carved with a tapering form, has naturalistic features: the eyes, nose, brow-line, and subtleties of the facial structure, including incised lines of demarcation and age. The top center of the forehead, and the right edge of the cheek are pierced for attachment. The nose is also openwork through the nostrils. The left side of the face has a thin edge fragmentation, and the chin and mouth areas are also missing. The top edge of the mouth appears to have been worn smooth over the years. This mask dates to circa: A.D. 1500 to 1600. A custom black metal stand is included. Condition: Fragmented as described above. 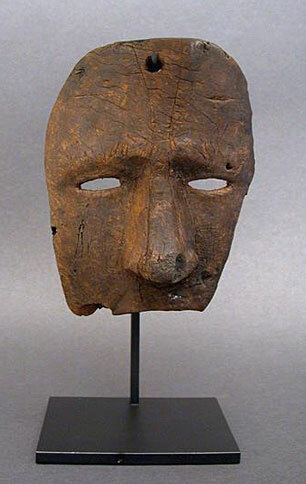 Otherwise, the remainder is in good, well-preserved condition for a 400-500 year old mask. Often, masks were found intentionally fragmented above the upper lip for the purpose of allowing the wearer¹s moving mouth and chin to be seen while worn in a ceremonial capacity. Provenance: This fragmented mask was excavated by its former owners on their private property at the Ketgnipaluk site, St. Lawrence Island, Alaska. Often, masks were found intentionally fragmented above the upper lip for the purpose of allowing the wearer¹s moving mouth and chin to be seen while worn in a ceremonial capacity.